Several month’s ago, I got reminiscing about foods I used to fix and why it is that I don’t fix them anymore. If picky eater was one of your guesses then you are right. The one dish I remember fixing and being a favorite of mine is Shepherd’s Pie. I can’t find the recipe I used to use because somewhere in one of our moves, it decided not to stay with us. So I did what I usually do lately and took to Pinterest to find me a recipe. I found several that looked good but the one that caught my eye was for mini pies. Who wouldn’t like a cute mini pie to grace their plate? I didn’t take photos while I was getting my pies ready but I have a finished picture. Not much to look at but they sure were yummy! Here is the basis for my dish. For some reason mine looks like I have a gravy in mine but to be honest I really don’t remember the exact recipe I used. The following recipe is one I have on my Pinterest board and since I remember looking at my phone for the recipe, I am sharing this from http://www.tablespoon.com. 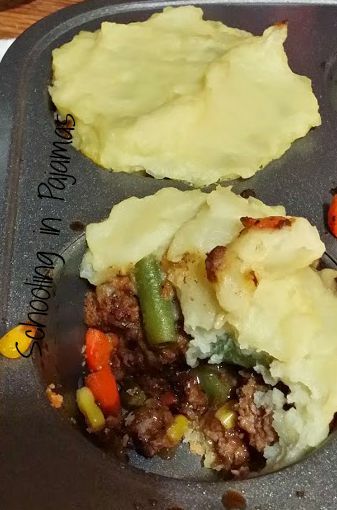 According to the site, one little mini shepherd’s pie is 460 calories! This would need to be lightened somehow and the only way I think of is to leave off the pastry dough. Fixing the pies in individual bowls would probably solve the problem of no dough. These are too good to let the calorie count keep you from eating one. Fix a salad and you have a good meal. I used homemade mashed potatoes instead of store bought. For broth, I use Kitchen Basics unsalted & all natural stock. I love this brand because it is gluten-free and tastes great. Do you have a shepherd’s pie recipe that is your favorite?